Acura's first-ever compact luxury crossover SUV, the RDX, received major renovations for 2013, introducing a brand-new design tailored toward families that shied away from its sport-styled roots. 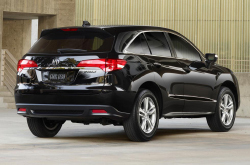 Cruising into 2014, the RDX maintains this same aesthetic, while integrating a few new upgrades, which include a fresh exterior paint option and a V-6 powertrain. Amenities featured in 2013 models resurface for 2014 and complement the recent additions. For more information on the 2014 Acura RDX in Phoenix, read our short summary below; then scroll down for further details on its specifications and exclusive photos. The toned down, yet sleek appearance of the 2014 Acura RDX opens up the SUV to a wider audience, bringing in new interested buyers. Highlighting the newly-integrated exterior concept is a fresh paint option: Kona Coffee. Inside, the SUV is spacious, providing excellent leg and headroom in the front and eight-way adjustable seating to accommodate passengers of all sizes. Standard leather seating is provided throughout the cabin along with heated front-row seats, a premium audio system, push-button start, Pandora Internet Radio and a power moonroof. An Active Noise Control system also reduces external sounds, producing a pleasant driving experience. Focusing on fuel efficiency, the RDX introduces an all-new V-6 powertrain for 2014. The 3.5L engine produces 273 horsepower and is matched with a six-speed automatic transmission. The integration may come as a surprise to some, considering rival SUVs have let go of their V-6 engines, but the change is actually beneficial, with the new component achieving better fuel economy than the former powertrain. Additionally, all RDX models are equipped with all-wheel drive - a noteworthy feature according the various 2014 Acura RDX reviews.